Region: This weevil can be found throughout eastern North America. Life cycle: This insect produces one to two generations each year and hibernates as an adult in the soil in woodlands and brushy areas. The eggs are laid on the damaged surface of fruit and produce larvae that feed then drop to the ground to pupate. 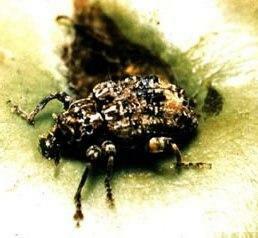 Physical description: This weevil is very similar to the Apple Curculio. It is only 1/4 inch long, dark brown and has fine, white hair on its body. Its wing covers are curved and have a sculptured appearance with four humps. Feeding characteristics: This pest attacks plums, as well as, apple, blueberry, cherry, peach, pear, and quince. The weevil appears in the orchard about the time trees begin to blossom. As soon as the fruit reaches about 1/4 of an inch in diameter, it begins to eat, leaving cuts or grooves in the flesh. The eggs are laid in these grooves and hatch larvae that bore into the fruit and feed for several weeks, usually causing the fruit to deform or drop and decay from the brown rot it develops. Controls: Since the larva stay in the fruit that drop for a short time prior to boring into the ground, you can disturb their life cycle by picking up the dropped apples and disposing of them in the trash or burying them in your compost pile. You can also shake branches, or hit them with a padded board, to knock them from the tree, and collect them on a sheet or tarp. They like to play possum when frightened. Because these insects try to avoid direct sunlight, keeping your trees well pruned can help reduce them. If serious problems persist, dust with Diatomaceous earth.